Governments should stop thinking about refugee camps as temporary places, says Kilian Kleinschmidt, one of the world's leading authorities on humanitarian aid (+ interview). "These are the cities of tomorrow," said Kleinschmidt of Europe's rapidly expanding refugee camps. "The average stay today in a camp is 17 years. That's a generation." "In the Middle East, we were building camps: storage facilities for people. But the refugees were building a city," he told Dezeen. Kleinschmidt said a lack of willingness to recognise that camps had become a permanent fixture around the world and a failure to provide proper infrastructure was leading to unnecessarily poor conditions and leaving residents vulnerable to "crooks". "I think we have reached the dead end almost where the humanitarian agencies cannot cope with the crisis," he said. "We're doing humanitarian aid as we did 70 years ago after the second world war. Nothing has changed." "When I said architects should get involved in humanitarian issues, people laughed at me"
Kleinschmidt, 53, worked for 25 years for the United Nations and the United Nations High Commission for Refugees in various camps and operations worldwide. He was most recently stationed in Zaatari in Jordan, the world's second largest refugee camp – before leaving to start his own aid consultancy, Switxboard. He believes that migrants coming into Europe could help repopulate parts of Spain and Italy that have been abandoned as people gravitate increasingly towards major cities. "Many places in Europe are totally deserted because the people have moved to other places," he said. "You could put in a new population, set up opportunities to develop and trade and work. You could see them as special development zones which are actually used as a trigger for an otherwise impoverished neglected area." Refugees could also stimulate the economy in Germany, which has 600,000 job vacancies and requires tens of thousands of new apartments to house workers, he said. "Germany is very interesting, because it is actually seeing this as the beginning of a big economic boost," he explained. "Building 300,000 affordable apartments a year: the building industry is dreaming of this!" "It creates tons of jobs, even for those who are coming in now. Germany will come out of this crisis." Kleinschmidt told Dezeen that aid organisations and governments needed to accept that new technologies like 3D printing could enable refugees and migrants to become more self-sufficient. "With a Fab Lab people could produce anything they need – a house, a car, a bicycle, generating their own energy, whatever," he said. His own attempts to set up a Zaatari Fab Lab – a workshop providing access to digital fabrication tools – have been met with opposition. "That whole concept that you can connect a poor person with something that belongs to the 21st century is very alien to even most aid agencies," he said. "Intelligence services and so on from government think 'my god, these are just refugees, so why should they be able to do 3D-printing? Why should they be working on robotics?' The idea is that if you're poor, it's all only about survival." "We have to get away from the concept that, because you have that status – migrant, refugee, martian, alien, whatever – you're not allowed to be like everybody else." Update 25/01/2016: The figure given by Killian Kleinschmidt for the average stay in a refugee camp is a reference to a 2004 UNHCR study, which estimated that the "average duration of major refugee situations" was 17 years. Talia Radford: Why did you leave the UN? Kilian Kleinschmidt: I left the the UN to be as disruptive as possible, as provocative as possible, because within the UN of course there is certain discipline. I mean I was always the rebel. Talia Radford: What is there to rebel about? Kilian Kleinschmidt: I think we have reached the dead end almost where the humanitarian agencies cannot cope with the crisis. We're doing humanitarian aid as we did 70 years ago after the second world war. Nothing has changed. 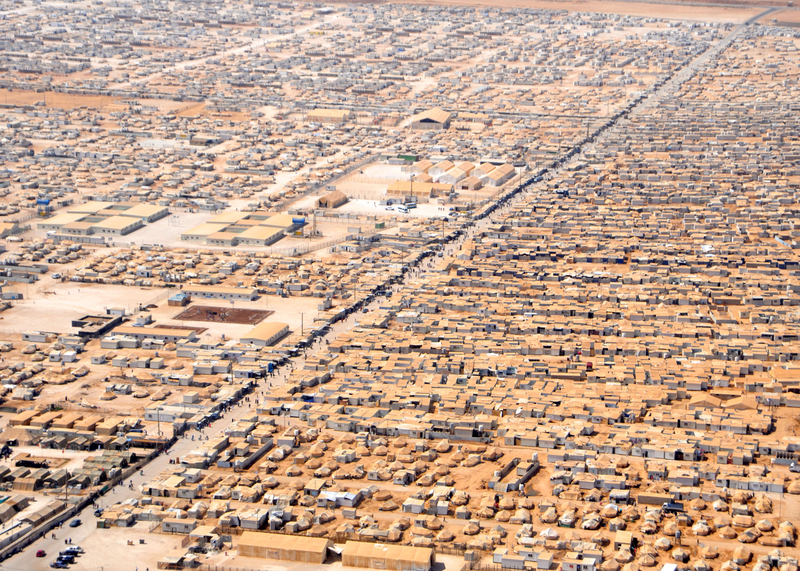 In the Middle East, we were building camps: storage facilities for people. But the refugees were building a city. These are the cities of tomorrow. The average stay today in a camp is 17 years. That's a generation. Let's look at these places as cities. Talia Radford: Why aren't refugee camps flourishing into existing cities? Kilian Kleinschmidt: It's down to the stupidity of the aid organisations, who prefer to waste money and work in a non-sustainable way rather than investing in making them sustainable. Talia Radford: Why are people coming to Europe? Kilian Kleinschmidt: Everybody who is coming here right now is an economic migrant. They are not refugees. They were refugees in Jordan, but they are coming to Europe to study, to work, to have a perspective for their families. In the pure definition, it's a migration issue. Right now everybody is going to Germany because in Germany they have 600,000 job vacancies. So of course there is an attraction, and there is space. Once the space is filled, nobody will go there anymore. They will go somewhere else. Talia Radford: How do refugees – or economic migrants – know where to go? Via the media? Kilian Kleinschmidt: No, it's all done through Whatsapp! Talia Radford: What is the relationship between migration and technology? Kilian Kleinschmidt: Every Syrian refugee in the Zaatari camp has been watching Google self-driving cars moving around, so [they] don't believe the information only belongs to the rich people anymore. We did studies in the Zaatari camp on communication. Everybody had a cellphone and 60 per cent had a smartphone. The first thing people were doing when they came across the border was calling back home to Syria and saying "hey we made it". So the big, big thing was to distribute Jordanian sim cards. Once we had gotten over the riots over water and lots of other things that politicised the camp, the next big issue was internet connectivity. Talia Radford: What are the infrastructure requirements of a mass influx of refugees? Kilian Kleinschmidt: The first is the logistics of accommodation: that's the survival bit. Everyone is struggling with this now, in reception centres, camps – every country in the world is dealing with this. Eighty-five to 90 per cent of any people on the move will be melting into the population so the real issue is how you deal with a sudden higher demand for accommodation. Germany says that they suddenly need 300 to 400,000 affordable housing units more per year. It's about dealing with the structural issues, dealing with the increased population, and absorbing them into existing infrastructure. Talia Radford: How do you see the refugee situation in Europe now? Kilian Kleinschmidt: The discussion in Germany is quite interesting, because they currently have 600,000 jobs to fill, but they are all in places where there is no housing. It's all in urban centres where they have forgotten to build apartments. Half of east Germany is empty. Half of southern Italy is empty. Spain is empty. Many places in Europe are totally deserted. You could redevelop some of these empty cities into free-trade zones where you would put in a new population and actually set up opportunities to develop and trade and work. You could see them as special development zones, which are actually used as a trigger for an otherwise impoverished, neglected area. Germany is very interesting, because it is actually seeing this as the beginning of a big economic boost. Building 300,000 apartments a year: the building industry is dreaming of this! It creates tons of jobs, even for those who are coming in now. Germany will come out of this crisis. In Pakistan, in Jordan, they say "Oh no! These people are all going back in five minutes so we're not building any apartments for them! Put them in tents, put them in short-lived solutions." What they are losing is actually a real opportunity for progress, for change. They are losing an opportunity for additional resources, capacities, know-how. Talia Radford: What other technologies have you dealt with in relation to refugees and migration? Kilian Kleinschmidt: Energy is the big one. Things are finally moving because of the energy storage, which we suddenly have with the Tesla batteries for instance. Decentralised production of energy is the way forward. Thirty per cent of the world's population does not have regular access to energy. We could see a mega, mega revolution. With little investment we can set up a solar-power plant that not only provides power to the entire camp, but can also be sold to the surrounding settlements. And water. In the Kibera slum in Nairobi, Danish groundwater pump supplier Grundfos partnered with a water company and you now have a smart-water terminal in the slum, where with smart cards you can buy clean drinking water. You buy your water from a safe location for a fraction of what the crooks of the water business in Nairobi would sell the water for. So suddenly it becomes affordable, it becomes safe, and you can manage the quantities yourself. A lot of change is facilitated by mobile phones. No poor person has a bank account any more in Kenya. Everybody has an M-Pesa account on their mobile phone. All transactions are done with their mobile phone. They don't need banks. They pay their staff now with your mobile phone. You charge their M-Pesa account. Talia Radford: Are any of these services being set up at refugee camps? Kilian Kleinschmidt: At Zaatari, the UNHCR never planned to provide electricity for the households. So people took it themselves from the power lines running through the camp. Electricity means safety, it means social life, it means business. Big business! People were charging €30 per connection and more. With a $3 million investment in pre-paid meters, you could have ensured every household would get a certain subsidised quantity of energy. The UNHCR didn't think it would have $3 million to invest in the equipment, and so it is spending a million dollars a month of taxpayers' money on an unmanaged electricity bill. Talia Radford: You helped set up a Fab Lab in Zaatari. Tell us a bit more about that. Kilian Kleinschmidt: It's not there yet, because it's very problematic to convince people that this is the right way for refugees to be "empowered" – to do something that actually belongs to the rich and beautiful and very connected people. That whole concept that you can connect a poor person with something that belongs to the 21st century is very alien to even most aid agencies. Intelligence services and so on from government think "my god, these are just refugees, so why should they be able to do 3D-printing? Why should they be working on robotics?" The idea is that if you're poor, it's all only about survival. I mean what's the difference between someone in Philly and somebody in a refugee city? We have to get away from the concept that, because you have that status – migrant, refugee, martian, alien, whatever – you're not allowed to be like everybody else. With a Fab Lab people could produce anything they need, a house, a car, a bicycle, generating their own energy, whatever. I mean a Fab Lab is there to do anything. We call it Beyond Survival. Talia Radford: What do you mean by Beyond Survival? Kilian Kleinschmidt: Beyond Survival deals with the psyche of people, to recognise that they need to regain everything they have lost, and this is not material, this is about their dignity. I mean the Syrians, for their wellbeing, they need a fountain and a birdcage and a plant and they need to sit next to the fountain to drink tea. That's their expression of home. So everybody at Zaatari was building fountains. Talia Radford: They built fountains in the camp? Kilian Kleinschmidt: Yes. You had all sorts of models of fountains. Fountains even built in the middle of tents. Huge fountains built with little pebbles and stuff. They were investing all the little they had into having a water pump with water coming out. There were even fountains with in-built televisions, light shows, you name it! The owner of my favourite restaurant had installed a pink fountain with pink-coloured water coming out. Next to this you needed a birdcage, a plant, a shisha, but also paintings and decorations, which of course created a market within the camp, but more importantly a sign of settling and a sense of identity. Because when you arrive at a camp you have basically been stripped naked and lost everything that has to do with your identity. And in a camp you are treated the same as everyone else, you are supposed to eat the same, drink the same, you get the same clothes. That's the humanitarian standard. But we need to understand that somebody might just want to build a jacuzzi in their home, and will find the means to get it! The funniest story was when this guy developed a cement swimming pool in his yard in a camp! He filled it with water and would charge children for using it. UNICEF shut it down eventually because it was not safe. "Poverty should never be an Instagram filter"